'Kofeyny Pereliv' Кофейный перелив (Olga Riabykh, R. 2012). Seedling# 9502-8. TB, 32 (81 cm). Early midseason bloom. 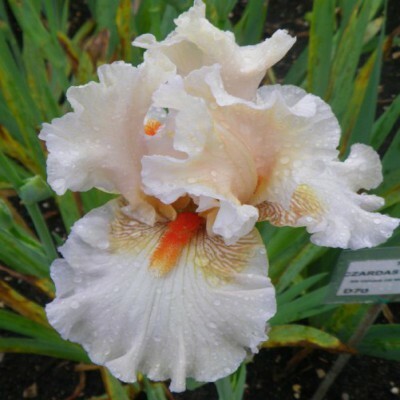 Standards cream-lilac, lighter edges; style arms white, light cream-brown midrib; falls white, cream venation, light cream-brown rim, light cream-brown on light cream pattern alongside beard; beards red, cream-red end; ruffled. 'Zhioltaya Orkhideya' X 'Mood Swing'. Riabykh 2013.